From Monday 4th March 2019 your recycling and waste collection service is changing. You will receive a letter by 1st March detailing the changes. 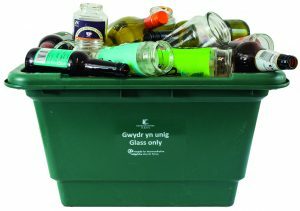 Households should have received a new recycling box for your glass bottles and jars. Please start using it from 4th March 2019. Glass recycling boxes will be emptied fortnightly. We can no longer collect purple bags that contain glass. 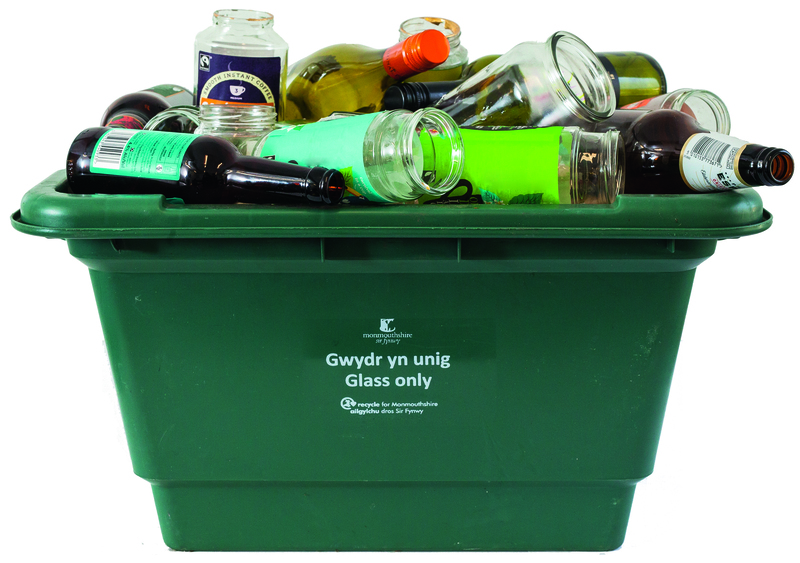 If you have not received a glass recycling box please contact us: email – contact@monmouthshire.gov.uk phone: 01633 644644, visit your local community hub. For some residents living in flats and sheltered housing, a communal bin or smaller container may be provided instead. From 4th March 2019, your recycling and waste collection days will change. The time of your collection will also change so please make sure you put your recycling and waste out before 7am on the morning of collection. Your new collection days will be in the letter you will receive by 1st March. Your new collection day information is now available online – When is my collection day? Separating the glass into boxes will improve the quality and value of all recycling in the county. For the majority of households, the glass boxes will be collected at the same time as your rubbish this is due to new vehicles which have a separate compartment for glass. Residents in rural areas will have their glass collected on smaller vehicles that can easily navigate the country lanes. For some residents living in flats and sheltered housing, a communal wheeled bin may be provided for convenience. For elderly and disabled residents, boxes with handles can be provided for ease of carrying. Monmouthshire’s glass will be sent to a reprocessing plant in Cwmbran then transported to be recycled into fibre glass, new glass bottles and concrete products. Red and purple bags recycling will continue to be collected weekly. Food waste will also continue to be collected weekly. For most households, food waste and red and purple recycling bags will be collected at the same time but on new vehicles with separate compartments (keeping red and purple bags separate). Rural areas are likely to be serviced by smaller vehicles. Free food waste bags and red & purple recycling bags will still be available at your local Community Hub or bag outlet. The new vehicles with separate compartments for materials will deliver better quality recycling and greater overall efficiencies.